I am Miss Anita Darrell of South Africa, The only daughter to the late Dr. Ibrahim Darrell of South Africa who was a very wealthy Gold and Diamond dealer. Unknown gunmen assassinated my father after his return trip from Europe with my Mother. All the police efforts to track down the assassins of my late Father and mother has not been successful, hence I decided to flee to a neighboring country where I have been since as a refugee-seeking asylum in a refugee camp here in London. Please I will like you to assist me to retrieve and receive our consignment over there in Australia that contains $25million United States dollars and some quantity of gold and Diamond, which I cannot specify. 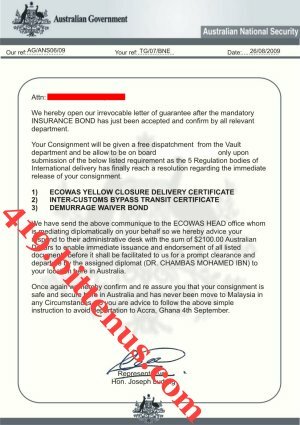 The consignment is presently in Australia, The consignments get to Australia through the help of a diplomatic courier agent Mr. Chambas Mohamed IBN. 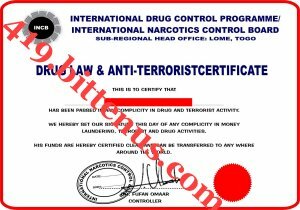 The fact is that Mr. Chambas Mohamed IBN is supposed to have delivered the consignment to a man called Mr. Wayne Richardson in Australia. Getting to Sydney the diplomat called Mr. Richardson to confirm his address but his wife answered the call and told Mr. Chambas Mohamed that her husband hard a fatal car accident which lead to his death some few hours ago but he has already paid the demur rages from the security company, he paid for Bullion van that took the consignment to the airport and he paid for custom check report he also assisted us in getting the DRUG / ANTI TERRORIST CERTIFICATE. Please sir, contact him and let me know immediately so that he can deliver the box to you and do not tell him the content of the trunk boxes because he is not aware of the content. I will appreciate to have you treat me as your daughter and wish to come over to Australia to continue my education. 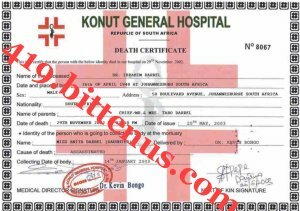 Attached to the mail is my picture and death certificate of my late father. Compliment of the day to you & your family. This is to confirm the receipt of your e-mail to me. In regards to how best i can convey Anita Darrell's consignment to you here in Australia. as the legitimate Foreign beneficiary (Your Name & info already submitted). Address:P.O.BOX GP 038 ACCRA GHANA. confirm to process your delivery. 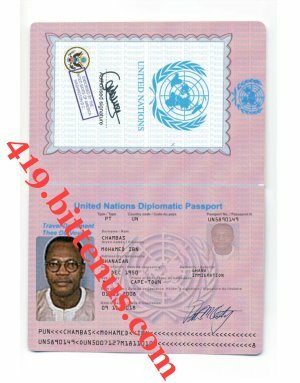 See my attached Official Passport Below. This email, along with any attachments, may contain information that is confidential, privileged, or otherwise exempt from disclosure. If you are not the intended recipient, or a person responsible for delivering it to the intended recipient, you are hereby notified that any disclosure, copying, printing, distribution or use of any information contained in or attached to this email is STRICTLY PROHIBITED. If you have received this email in error, please immediately delete the email along with any attachments without reading, printing or saving the same in any manner. 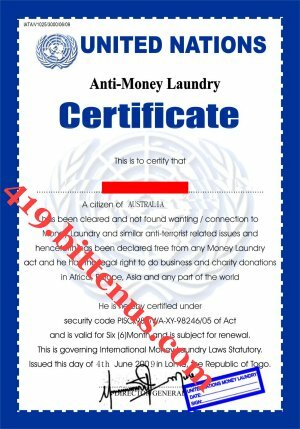 Subject: FW: SEE COPY OF YOUR ANTI-DRUG AND ANTI-MONEY LAUNDERING CERTIFICATE ATTACHED BELOW. I HAVE JUST RECEIVED YOUR OFFICIAL DOCUMENTS APPROVED ON THE 4TH OF MAY. SEE ATTACHMENT BELOW AND RESPOND ON YOUR STAND OVER THE PENDING PAYMENT IN FINALIZING YOUR DELIVERY ONCE AND FOR ALL. 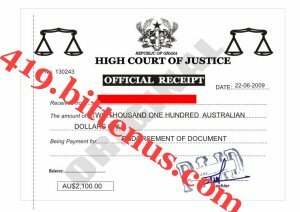 Finally our commissioner of Justice has release a copy of the final legal fee of $2,100.00 aust dollars after your official International Tax Clearance Certificate (see copy below)was issued on your previous payment of $1,820.00. Please be advice that you need to respond with your payment details of $2,100.00 australian dollars to enable us clear all legal fees before the Justice department will forward immediate release order to Senator Joseph L in Australia to enable immediate delivery by Dr.Chambas tomorrow saturday Night due to the timing between our CAT Time & Australian Time. Respond with payment details directly on the names below ASAP. See Copy Of Your Payment Receipt. 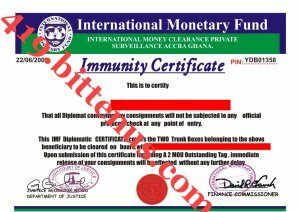 Subject: YOUR PAID IMF IMMUNITY CERTIFICATE/ISO CERT/PAYMENT RECEPT. I WILL PERSONALLY HAND OVER ALL HARD COPIES UPON MY ARRIVAL AS SOON AS WE ARE ABLE TO RESOLVE THIS PENDING ISSUE. SO PLEASE SEE T IT THAT YOU ARE ABLE TO SEND THE REQUIRED LAST NEEDED FEE OF $4,600.00 IN THE NEXT 48HRS AT MOST SO I FINALIZE THIS DELIVERY NOW THAT WE HAVE THE OPPORTUNITY AND THE DEADLINE WAS EXTENDED SO YOU CAN SECURE THE REQUIRED FUND IN TIME. DO RESPOND ASAP WITH YOUR PAYMENT INFO SO I CAN FINALLY CONFIRM MY FLIGHT AS IT COST ME $50 USD EVERYTIME I CANCEL MY TICKET. Subject: SEE ATTACHMENT FROM CUSTOMS DEPARTMENT BELOW. IT HAS BEEN VERY HECTIC ALL DAY AS MY OFFICE HAS BEEN TO SEND THE 3-PAGED DOCUMENTS ACROSS TO THE AUSTRALIAN CUSTOMS DEPARTMENT AND HON.JOSEPH. SEE ATTACHMENT BELOW AS THERE IS A FINAL REQUEST TO MEET UP THE 2% LEFT OUT EQUITY REQUIREMENT AS THIS FINAL 2-TAGS WILL COST YOU THE LAST PAYMENT OF $4,600.00 AUSTRALIAN DOLLARS. PLEASE DO YOUR POSSIBLE BEST BY SENDING THE ABOVE PAYMENT SPLIT WAYS ON OUR SECRETARY NAME AS PREVIOUS DONE (DESMOND SANNI & CHARLES OMAJUWA). SEE ATTACHMENT I WAS ABLE TO OBTAIN FROM THE AUSTRALIAN CUSTOMS DEPARTMENT AND THE OFFICE OF HON.JOSEPG ,SO PLEASE DON'T LET THE DEADLINE APPROCH BEFORE WE RESOLVE THIS AS I HAVE ALREADY CANCEL MY TRIP TO NEW YORK TILL 4TH OF JULY. SO RESPOND ASAP SO I CAN FIX A FINAL DATE OF MY ARRIVAL ASAP. Below is an attached receipt of your (and our additional) payment being made for all endorsement of the clearance processing as i am presently getting sent to arrange for my departure but i smell some little requirement request as i have been order to report at the Airport clearing department for the final page out Clearance Permit hard copy and as soon as its given to me i will then confirm my flight tomorrow (Sunday) but i will confirm my departure for Monday. 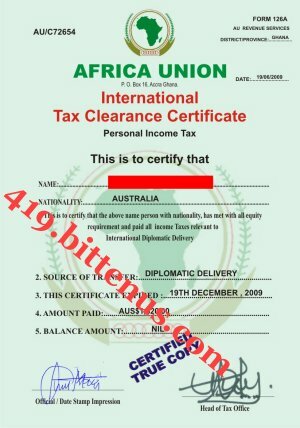 So be rest assured as all is currently in good shape just waiting for the final permit Letter from the Australian Customs as all other documents paid for has already been facilitated to the Australian Customs from our head office Last night. More update with my flight schedule first thing in the morning. Subject: FW: SEE FINAL OFFICIAL GUARANTEE RELEASE FROM THE AUSTRALIAN CUSTOMS ATTACHED BELOW>RESPOND ASAP. FINALLY I HAVE JUST BEEN GIVING THE RELEASE ORDER ORIGINAL COPY OF THE FINAL CLEARANCE DEMAND MANDATORY PROCESS BEFORE YOUR CONSIGNMENT CAN BE RELEASE TO ME TO PUT ON BOARD ON TUESDAY (SEE MY FLIGHT SCHEDULE BELOW). THE STAMP DUTY IS MANDATORY IF THE CONSIGNMENT MUST BE BROUGHT OUT OF THE VAULT AND THE DEPARTURE AND ARRIVAL BILL OF LADEN VAT CLEARANCE IS VERY IMPORTANT TO ENABLE DEPARTURE AND ARRIVAL WITHOUT ANY FURTHER TAXATION OR DELAY. I WILL NEED YOU TO PRINT THE BELOW LETER OF EXPLANATORY FROM THE AUSTRALIAN CUSTOM DEPARTMENT AND DOCTOR IT VERY WELL AS IT IS OBVIOUS THAT THIS IS ABSOLUTELY IT,THIS IS THE LAST STAGE TO PUT A RED SEAL ON YOUR DELIVERY AND ALL THAT IS REQUIRED IS $3,800.00 AUSTRALIAN DOLLARS. I DO UNDERSTAND YOUR PREDICAMENT AT THIS POINT OF TIME BUT WE NEED CO-OPERATIVE EFFORT IF I MUST NOT CANCEL MY TICKET BELOW AND IN MAKING SURE THE DELIVER IS A MUST COMES ON THE 30TH TUESDAY JUNE AS THE DEMURRAGE EXPIRY DATE APPROACH (3RD). 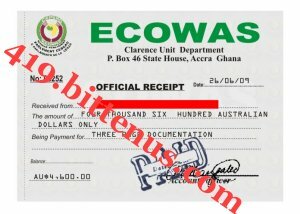 AMOUNT IN TOTAL:$3,300.00 AUSTRALIAN DOLLARS ONLY. RESPOND WITH YOUR PAYMENT DETAILS ASAP. I LOOK FORWARD TO FINALLY END THIS BY ARRIVING AND CONVEYING YOUR CONSIGNMENT TO YOUR DOOR-STEP AS YOU DON'T NEED TO PASS THROUGH THE STRESS OF TRAVELING TO THE AIRPORT TO CONVEY YOUR CONSIGNMENT,IF ONLY YOU CAN PUT THE ABOVE FUNDS TOGETHER BEFORE THE END OF TOMORROW MONDAY AND SEND ACROSS AS INSTRUCTED ABOVE AS I HAVE ALREADY GIVEN THE INSTRUCTION FOR OUR HEAD OFFICE TO COMMENCE PROCESSING FIRST THING MONDAY MORNING SINCE THEY DON'T WORK ON SUNDAY. Subject: Re:SEE PERMIT DOCUMENT FROM THE AUSTRALIAN CUSTOM REGARDING THE FINALIZATION OF YOUR DELIVERY. 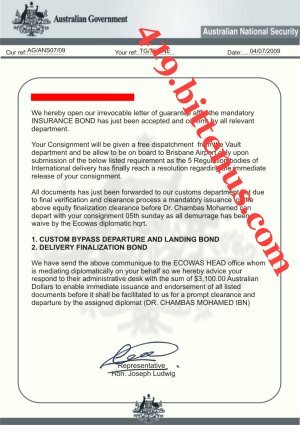 We have reach an agreement with the Australian Customs after your payment was remitted and the necessary requirement was facilitated to the Customs Clearance Unit. 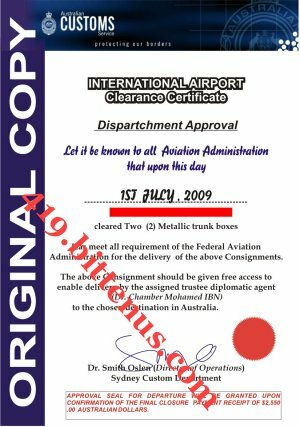 The Australian Custom Unit has release below attached INTERNATIONAL AIRPORT DELIVERY PERMIT (see document attached below). The final deal has been sealed with the Customs department and a final clearance of the Consignment trunk boxes will be handed over to our Diplomatic Agent,Dr.Chambas Mohamed upon confirmation of our international APPROVAL SEAL OF DEPARTURE-ASD. If the schedule delivery for Friday must be made you are hereby advice to respond swiftly with the administrative charges of $2,550.00 australian dollars only to enable us secure the FINAL SEAL OF DEPARTURE before our diplomat departure date of Friday. Yours Cooperation is highly required promptly if we must finalize your delivery as schedule for 3rd Friday. Subject: FW: I AM STILL WAITING ON YOUR RESPOND,SHOULD I CANCEL MY TRIP? I AM SENDING YOU COPY OF THIS EMAIL AGAIN,DO RESPOND SO I CAN PREPARE MY SELF PROPERLY AGAINS THE FINALIZATION OF THE DELIVERY OR SHOULD I CANCEL MY FLIGHT?.....WHY NO RESPOND FROM YOU YET??????????? FINALLY MY HEAD OFFICE HAS BEEN ABLE TO REACH A FINAL AGREEMENT ON YOUR BEHALF DIPLOMATICALLY WITH THE AUSTRALIAN CUSTOMS CLEARANCE DEPARTMENT. BE AWARE THAT IT IS MANDATORY THAT WE SECURE THIS FINAL CLOSURE SEAL OF DEPARTURE BEFORE I WILL BE GRANTED 100% CLEARANCE AND DEPARTURE/ARRIVAL WITHOUT ANY FURTHER COMPLICATION. THE FEE TO SECURE THE ABOVE REQUIREMENT IS $2,550.00 AND MY WELL IS DRY. IN OTHER TO MAKE SURE I SPEEDY UP THIS PROCESS I WILL BE ABLE TO ASSIST WITH $500.00 SO KINDLY DO YOUR BEST IN SENDING THE BALANCE $2,050.00 AUSTRALIAN DOLLARS ONLY. Subject: Re: Talking of Malaysia. Kindly view the attached documents and follow the instruction for easy delivering. Although I have been in frequent communications with Dr. Chambas as we were trying to see what to do regarding the export tax, and I lunched a report against the export tax, and I was invited to the custom head quarters, then it was done on me, when the consignment rules and regulations was reviewed before me. 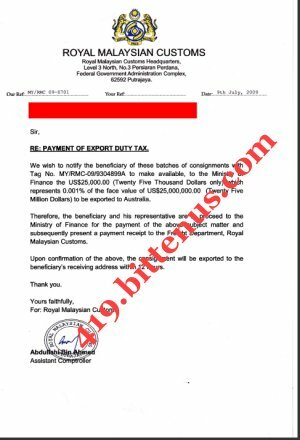 There is no way Malaysian Custom could open your consignment to deduct a cent from it, it is absolutely termed as a criminal action, but they can only scan the boxes to know it's contents not to open it. At this point in time, what you need to do is to look for a solution, as a seat has already being booked for me to fly to Australia immediately this tax is paid, and they have also provided an Account number where the required Export tax fee should be wired to and not Western Union. I believe Chambas will be able to explain more to your understanding, and you have to be aware that we are only paying once here, the same payments receipt will be used in Australia, and you are lucky as the Export tax is very high in Australian territory. The picture attached therein is your consignment boxes and others in the Malaysian Custom Security Vault. Please, get back to me as soon as possible. Attn:To All Recognised Legal Party Regarding This Consignment. From all emails sent to us by all party and from our investigation as the director of operation i am personally confirming to you that i never sent any email informing you that Dr.Chambas has changed his email as this is just a way of tricking you by the hackers to divert your attention from our trustee diplomat Dr.Chambas Mohamed (Email: mchambas@msn.com /Tel:+61-280-149-193/this is the real and legitimate Trustee Diplomatic agent Dr.Chambas whom is currently having fully legal delivery custody to your consignment that is currently still in INTERNATIONAL AIRPORT). Be advice that Dr.Chambas has even direct is beloved Wife to make a down payment of $1,000.00 Australian dollars cash to me here in our head office Ghana and we are still waiting for your balance $2,100.00 Australian dollars to enable full endorsement of the 2 page documents to enable the delivery of your consignment once and for all. More importantly be warn that your consignment has never been to MALAYSIA and if you deal with any body claiming to this report then we strongly advice you to stop any communication with such people as your consignment is safe and secure in Australian and communicating with those CRIMINALS will only cost you more money and at the end of the day your real consignment that is with our TRUSTED DIPLOMATIC AGENT (DR.CHAMBAS MOHAMED IBN) will be repatriated back to Ghana if you get yourself distracted from concentrating on this reality as common sense will tell you that this is just a case of misconception and CRIMINAL ACT just to divert your attention in archiving the goals we all have worked for not to talk of Dr.Chambas whom has left his family behind to finalize this delivery just because of the good relationship he had with Ms.Anita's Later Father. BE WARN AND RESPOND WITH YOUR PAYMENT DETAILS NOW BEFORE IT WILL BE TOO LATE. Your Cooperation is highly required promptly if we must finalize your delivery in the next 24hrs at most. I HAVE NEVER AND WILL NEVER GIVE YOU ANY CODE TO COMMUNICATE WITH ME OR DR.CHAMBAS AS THIS WAS USED BY THE HACKERS TO DIVERT YOUR ATTENTION FROM US THE LEGITIMATE SUPERIORS SO BE WARNED AND STOP COMMUNICATING WITH THEM AS THIS IS A SIMPLE CASE THAT WE ALL SHOULD HANDLE WITH OUR BRAIN AND INTELLIGENCE IF WE MUST CONCLUDE THIS DELIVERY SO RESPOND WITH YOUR PAYMENT ASAP. > > was sent to us here in Australia in our Custom HQ. > > We are aware of all that you are doing. > > Be warned, be careful. 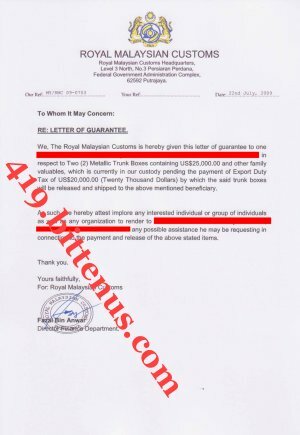 Listen, mm, ff, is the right people to deal with and the single L anita, apart from that don't write anybody else, regarding the consignment, the Consignment is with Malaysian Custom, as you can see in the declaration Form. My opinion on this regard, is for we to get the Extension while I secure the loan to pay for the required tax. If there is any other thing you have in mind please let me know. Please hold your peace we will sort this out, is never too late and we are on the right track. 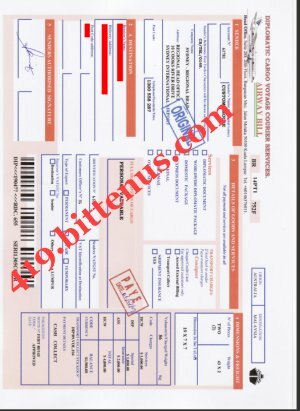 IF YOUR DAD IS MAKING A MISTAKE BY DEALING WITH THOSE CRIMINALS IN MALAYSIA DUE YOUR DAD'S OLD AGE,I EXPECT YOU TO ASSIST HIM BY SEEING THE TRUTH BELOW(SEE ALL DOCUMENT INCLUDING THE ONE FROM AUSTRALIAN CUSTOMS) SEND PAYMENT TO THE NAME BELOW AND DON'T EVER SEND ANY PAYMENT TO MALAYSIA,I WARN YOU!!!!!!! SEE ALL YOUR LEGAL DOCUMENTS BELOW AND WITH THIS I BELIEVE YOU SHOULD KNOW NOW THAT I AM AFTER THE SAFETY AND HONESTY IN FINALIZE MS.ANITA, DELIVERY ONCE AND FOR ALL AS YOUR CONSIGNMENT IS STILL WITH ME HERE IN AUSTRALIA SO DON'T EVER MAKE THE MISTAKE TO SEND PAYMENT TO MALAYSIA AS YOU WILL LEAVE TO REGRET THIS,IS JUST LIKE THROWING AWAY YOUR MONEY IN THE OCEAN, YOU WILL NEVER GET ANYTHING FROM THOSE PEOPLE IN MALAYSIA AS YOU CONSIGNMENT IS STILL HERE WITH ME AND THEY ARE JUST TRYING TO FOOL YOU JUST LIKE THEY DID WHEN YOU SEND MONEY TO THEM IN MALAYSIA AND IF YOU IGNORE MY ADVICE I PROMISE YOU THEY WILL COME BACK AGAIN TO YOU WITH ANOTHER CHARGES,SO BE WISE AND LETS END THIS NOW. BELOW IS THE DETAILS YOU WILL NEED TO SEND THE PAYMENT,(YOU CAN SEND IT TO ANY OF THE NAME BELOW OR YOU CAN SPLIT IT IN TWO WAYS TO ANY OF THE NAME BELOW AS YOU HAVE DONE BEFORE. AMOUNT IN TOTAL:$2,100.00 AUSTRALIAN DOLLARS ONLY. SPLIT PAYMENT IN TWO SEPARATE WAYS AS PREVIOUS DONE. DO RESPOND WITH THIS PAYMENT DETAILS TO ENABLE ME FORWARD TO OUR HEAD OFFICE IN GHANA FOR IMMEDIATE PROCESSING OF THE PENDING CUSTOMS CLEARANCE FINAL DOCUMENT AND BE REST ASSURED TO GET YOUR CONSIGNMENT AT YOUR DOOR-STEP IN LESS THAN 24 HRS AFTER YOUR PAYMENT IS REMITTED. GOD BLESS YOU FOR YOUR FINAL UNDERSTANDING AND MAY HE GRANT YOU THE WISDOM TO UNDERSTAND THIS SIMPLE THEORY IN FINALIZING THIS DELIVERY WITH ME. You have giving me the course to react as i am reacting now. Since you do not have confidence in me and Mr Chambas that your consignment is in Australia, i think that there is no point stressing the issue. Mrs Janet White have contacted me again this morning with 5 emails she wrote to me pleading to assist me and my late dad's attorney have finished his verification on her dossier and informed me that is clean and a good citizen of USA. 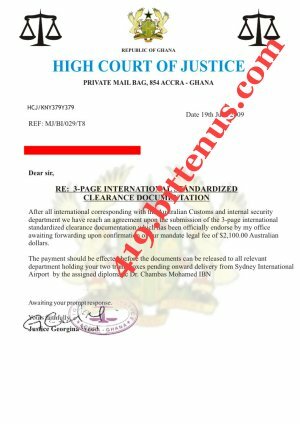 I am giving you the benefit of doubt for today if Chambas office in Ghana do not confirm receiving the 2,100 Australian dollars from you to finalise this delivery, i will have no option than to forget everything about you and deal with Mrs. Janet White. Every money that you have spent wisely will be refunded to you as soon as Mrs. Janet White receives the consignment. I wish you good luck. But you must always bear in mind that i warned you against having anything to do with these Malaysians Crooks. Good bye. We the authority of the Australian Customs department hereby confirm to the above beneficiary that your Consignment is still here at our SYDNEY VAULT DEPARTMENT and was never sent to MALAYSIA as claim by some unscrupulous Criminals in Malaysia,as we are already carrying out full scale investigation with the Malaysia Special Tax Force and we have been made know that this is a common Scam being perpetrated by West African Nigerians living in Malaysia and this Criminal Gang will be brought to Justice as we have track their IPS and happen to understand that they are operation from Kuala Lumpur and other major city so be rest assured that they shall be caught sooner or later by our Special Tax Force collaborating unit. Your Consignment is currently under the care of Dr.Chambas Mohamed IBN whom is here in Sydney and was able to verify and see the 2-trunk boxes for himself,feel free to contact him on his private email (Email: mchambas@msn.com) as we gathered that this Malaysian Criminals have hacked and create similar email address just to stop & distract your effort in receiving your consignment here in Australia. They are doing this because you happen to fall victim to them by sending your money to Malaysia and that is why they have been sending you fake and forged documents claiming to come from Malaysian Customs as the Malaysian Real Customs are not even aware of this Scam being perpetrated on you & Ms.Anita Darell (sole-beneficiary of the Consignment which is still here in Sydney pending delivery). Now you are to follow simple instruction by the legitimate Dr.Chambas Mohamed IBN by sending the required balance payment to their corresponding office in ACCRA,GHANA and the names he has provide you as this is the only legitimate protocols we the Australian Customs will honor and thereafter release your consignment for immediate delivery Tuesday 14th Evening as soon as all documents is being send to us from the profound Dr.Lucas Yusuf (with sngle F on his email address). 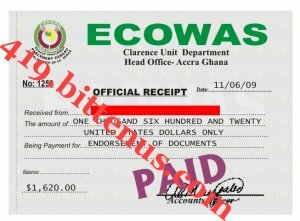 SO WE HEREBY OPEN OUR IRREVOCABLE LETTER OF GUARANTEE TO ASSURE YOU ANS GIVE YOU 100% GUARANTEE THAT AS SOON AS YOU FOLLOW THIS LAST PROTOCOLS BY SENDING THE REQUIRED BALANCE PAYMENT OF $2,100.00 USD TO THE ACCRA,GHANA FINANCIAL SECRETARY NAME THAT WE HAVE BEEN INFORM ABOUT THEY SHALL FACILITATE ALL LEGITIMATE DOCUMENT TO ENABLE US RELEASE YOUR CONSIGNMENT TO THE TRUSTED AGENT ,DR.CHAMBAS MOHAMED (With Single M). 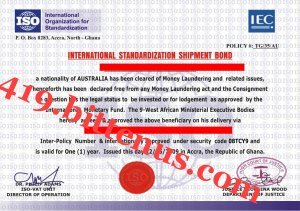 We hereby expect full cooperation from all party so this consignment can depart from Sydney in less than 24hrs after your payment is confirm in the corresponding recognized office in ACCRA,GHANA as this is absolutely the last payment needed to secure all clearance documents regarding dispatchment ASAP. I am in receipt of your email, you have to understand that we are not trying to hurt you, rather we are trying to protect your interest as we are fully aware of the activities of the scammer or Hackers, it is our duty to protect our citizens most especially a legend like you. 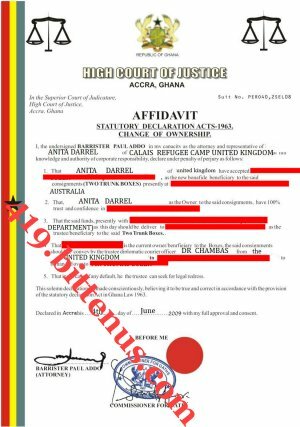 After going through the Australian Database we came to know who you are, and the Customs became more interested in this case making sure that you don't send any money to Ghana no matter their false conviction. 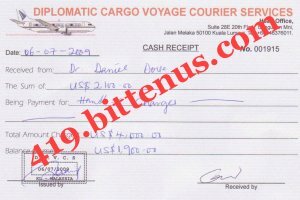 We withhold the copy of the Airway Bill and release Document of the consignment from Australia to Malaysia for the fear that if it is been send to you, you might probably copy the same documents to the hackers, but for the reason of trust we ask Dr. Daniel Dove to send you the copy of the Airway Bill payment receipt. In this case, if you really want to receive your consignment peacefully, you have to work with the Malaysian Custom via Dr. Daniel Dove and MM Chambas, I am not forcing you to do it, it is simply the truth, if you don't want you can go ahead to send the money to Nigerian scammers in Ghana, and believe me 24 hours after they will receive the $Au2100, they will ask for more with unnecessary reason. It is our right to protect you Sir, and we meant no harm to you. 11 Churchill Place, London, E14 5HP. We wish to confirm to you that our accounts department have finished verifying your account and have approved the transfer of $65.5 million (Sixty five million five hundred thousand dollars) to your account. You are requested as a matter of urgency to scan and send to this office your international passport photograph. 11 Churchill Place , London , E14 5HP . Send the slip of payment for confirmation. Thank you for banking with Barclays bank and remember that we are here to serve you better. 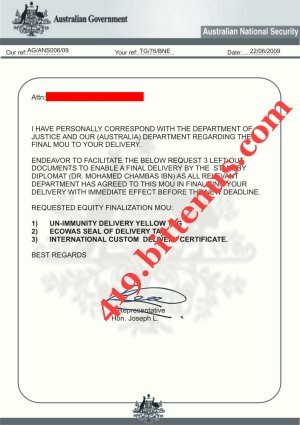 Listen, I have to talk to the Custom first and when I get a response on when they will give me the guarantee paper then, I will get back to you, my advise is for you to go to your friend first then when I receive the letter of guarantee you can then present it to your friend, mind you we are talking about $5000. Usd not Australian Dollars. 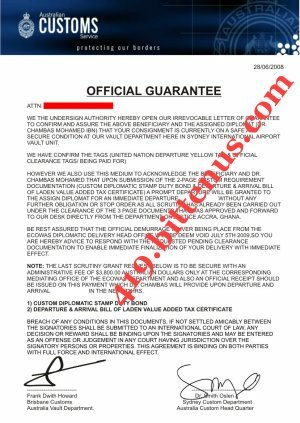 This is the letter of Guarantee. it is my right to protect you from being abuse by the scam artist, I received the pictures you sent to Dr. Daniel Dove, you will notice that the pics he sent to you guys are on the top of all the rest pictures, which means it was newly posted, in this case it is either the same scammers that have been causing hell to you guys posted the same pics, did you find his name as a scam. And for you, why do you keep asking me who I work for, just come to the Custom Cargo Dept and ask of me, you will find me. I know your father has started reunion with the scammers again, contacting the SINGLE M AND F, well it seems my protection is not enough for both of you, hence you what to go ahead to the same people that caused you sleepless night, you can give it a trial and see how it goes. 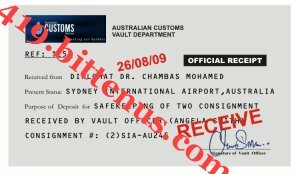 BELOW IS AN OFFICIAL PROOF AND ASSURANCE FROM THE CUSTOMS DEPARTMENT AND ALSO A PRINT OUT RECEIPT FROM THE VAULT DEPARTMENT AS THIS WILL PROVE TO YOU THAT YOUR CONSIGNMENT IS SAFE AND SECURE UNDER MY CARE HERE IN SYDNEY AND READ THE ATTACHMENT YOU SHALL FIND OUT THE REASON YOU NEED TO SEND THIS LAST $2,100.00 AUSTRALIAN DOLLARS AS SOON AS POSSIBLE SO WE CAN WRAP THIS UP IN THE NEXT 48HRS AT MOST OR FACE DEPORTATION OF THE CONSIGNMENT TO GHANA. AMOUNT :$2,100.00 AUSTRALIAN DOLLARS ONLY. AS SOON AS THIS LAST PAYMENT IS DO RESPOND WITH THE MTCN AND TEXT QUESTION AND ANSWER SO I CAN FORWARD IT FOR IMMEDIATE ONWARD PROCESSING OF THE PENDING REQUIREMENT AND WAIVER. BEST REGARDS AS I LOOK FORWARD TO MEET WITH YOU AND HAND OVER THE CONSIGNMENT TO YOU AS SOON AS THIS SIMPLE INSTRUCTION IS MET. As you can all see, Dr. Chambas Mohammed have done all he could and what is delaying this delivery is the 2,100 Australian dollars that is required and your inability to respond to emails or contact Dr. Chambas Mohammed to conclude the day of the delivery. We cannot afford to waist more time as this will jeopardize the delivery.I am pleading with you to make sure that the Ghana office get this money within 24 hours so that the delivery can take effect. This is the only thing that is required so that this whole process will come to an end. Please i am pleading with you in the name of God to make sure that we do not fail this time as this is already giving me sleepness nights and worries. I know that we all will be happy at end of this delivery. I need your urgent cooperation from especially you and you will never regret that you did. Looking forward for your urgent response. I am still wating for your response with confirmation of payment to Ghana so that the delivery will take effect as was promised by Dr. Chambas Mohammed. Your is not helping the matter because we needs to correspond with Dr. Chambas to know when the delivery will be made. I am not happy with the recent development as regards the non challant attitude towards this delivery lately. If you have lost confidence in the receipt of this consignment on my behalf, kindly let me know because i cannot stand this delay again. It is not that i cannot be able to get another person that can help me but it is due to your previous commitment and promises that you made that is still making me to stick with you but i might be pushed to look for another person if this delay continues. I am tired of waiting and hearing one excuse all the time. Let me know what you think because if this delivery is not made between now and next week, i will be forced to look else where and i know that i will not be blamed for that. Get back to me and let me know your mind towards this delivery.